You may find here few links for photo collections from the 1st FAI Junior Hot Air Balloon Championship. This entry was posted in 1st FAI Junior World Hot Air Balloon Championship, Events, first, News, Photos, Pre-World Junior 2011 on June 1, 2012 by phz. This entry was posted in 1st FAI Junior World Hot Air Balloon Championship, CIA, Events, first, News, over, Pre-World Junior 2011, Results on May 27, 2012 by phz. The Event Debriefing of the 1st FAI Junior Hot Air Balloon Championship will start at 17:00. The last task briefing will start 18:30. The Task sheet is ready: calculated rate of approach task and Minimum distance time. Two take-off is permitted. 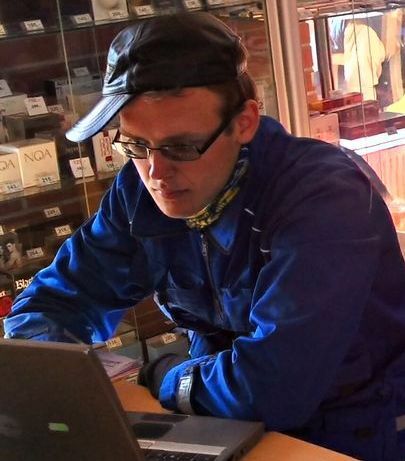 Rokas Kostiuskevicius was the best pilot after 10 tasks but three tasks results are not published. The championship is still open. A cold front approaching the area. Flight will be cancelled on the Task Briefing at 18:30 26/05/2012. No more competiton flight on 1st FAI Junior Hot Air Balloon Championship. This entry was posted in 1st FAI Junior World Hot Air Balloon Championship, CIA, Events, first, News, Pre-World Junior 2011, Results on May 26, 2012 by phz. Sunny but little bit cold morning, common launch from the city. We made the early wake-up for the citizens. 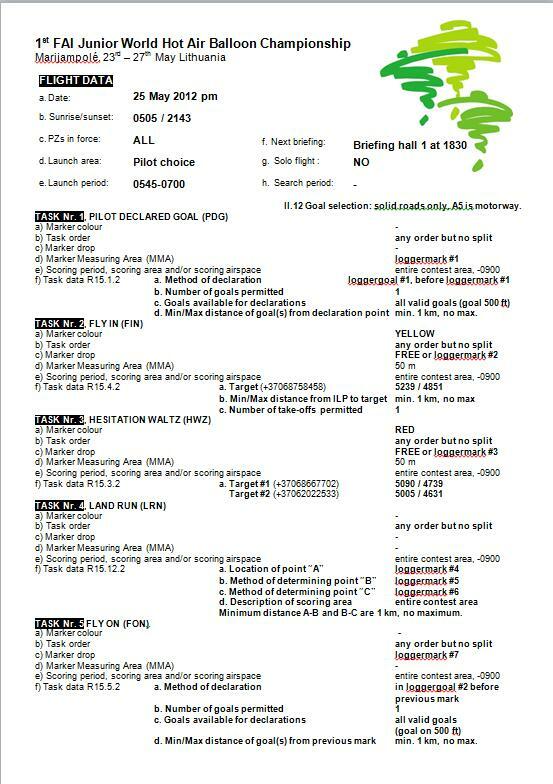 Five tasks in the Task Sheet: JDG, HWZ, Pilot Declared Race to an Area, Elbow and Fly on. The Pilot Declared Race to an Area is a modified Race to an Area where the pilot have declare when he cross a line on the map. The winner is who can declare smallest result from the declared time and actual time of achieving first valid track point after the line. The results are published here. This entry was posted in 1st FAI Junior World Hot Air Balloon Championship, Events, News, Pre-World Junior 2011 on May 26, 2012 by phz. We have nice weather. The first target in the city center where we are expect lot of spectators. The hare balloon will start at 20:30 and his intended flight duration is 30 minutes. The competitors shall have to fly an Angle task after the second marker drop. Good luck! This entry was posted in 1st FAI Junior World Hot Air Balloon Championship, Events, News, Pre-World Junior 2011 on May 25, 2012 by phz. Rokas Kostiuškevičius was the best at first target. We had to delete three flight already but the wind is calmed. Five tasks on the Task Sheet: PDG, FIN, HWZ, LRN, FON in any order. This entry was posted in 1st FAI Junior World Hot Air Balloon Championship, Events, News, Photos, Pre-World Junior 2011 on May 24, 2012 by phz. This the most difficult situation to interpret for public. Nice sunny weather and we are not sure about the flight. The wind is stronger as promised by the forecast but we are optimistic. Two tasks are on the task sheet: Hesitation Waltz with three targets and Fly on. Targets and common launch points and prohibited zones waypoints are available here. 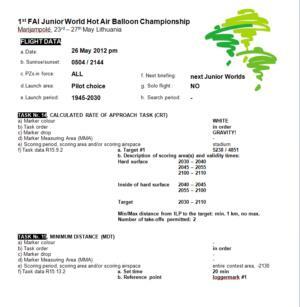 This entry was posted in 1st FAI Junior World Hot Air Balloon Championship, Events, News, Pre-World Junior 2011 on May 24, 2012 by phz. After a very nice Opening Ceremony we had the first task briefing. 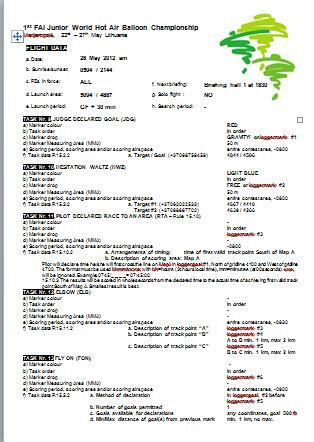 Common launch, Minimum Distance Time and Fly on tasks was on the task sheet. We had strong wind at afternoon and tonight. We gone to the common launch area and we was waiting to wind calm down. When the wind calm down then no time to flight any task. The first flight is cancelled. We accept strong wind for the morning too and better condition for afternoon. 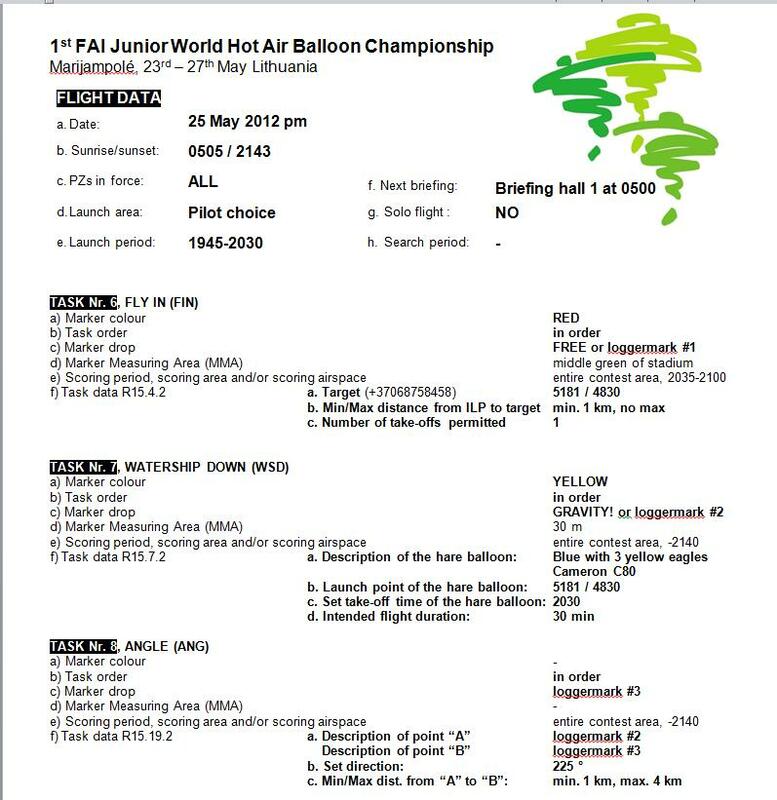 This entry was posted in 1st FAI Junior World Hot Air Balloon Championship, Events, News, Pre-World Junior 2011 on May 23, 2012 by phz.